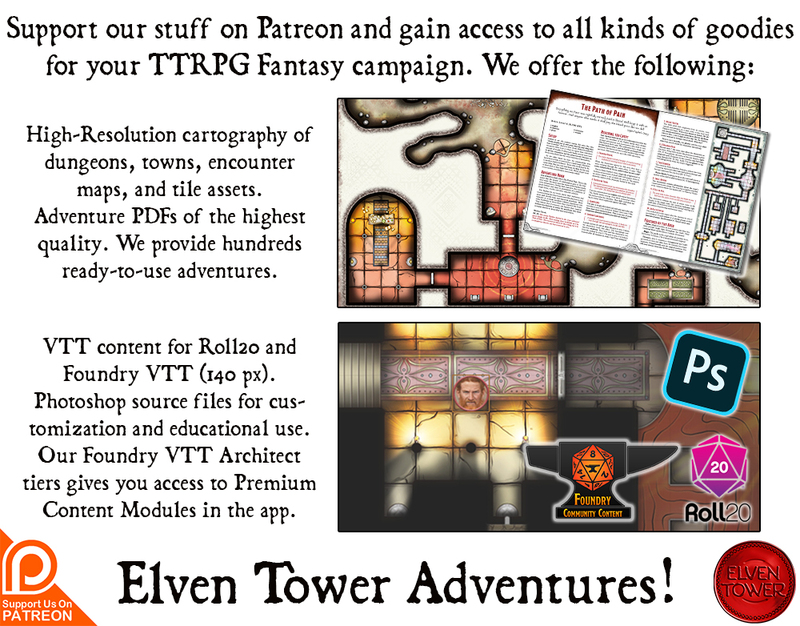 This resource features the general description of dwarven city, it includes adventure ideas that can be scaled for parties in the heroic tiers (levels 1 to 10). 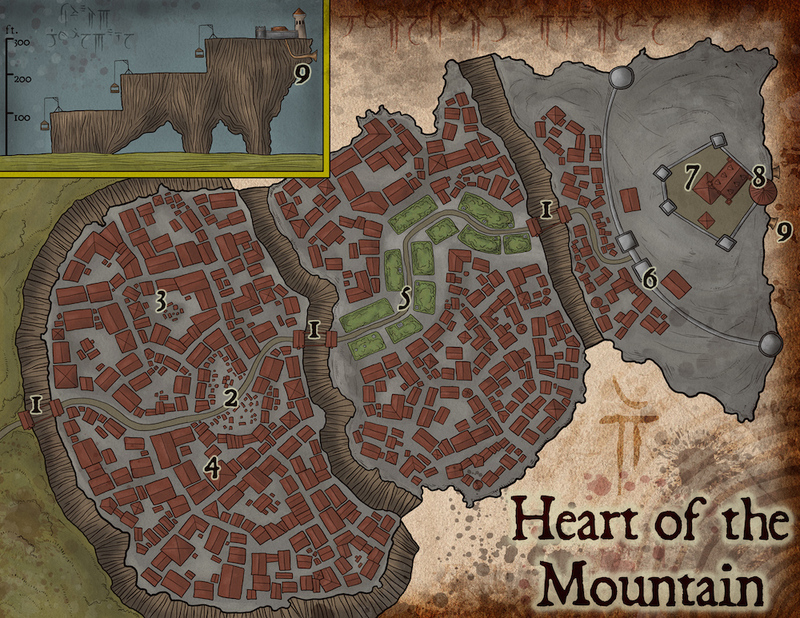 Heart of the Mountain is a dwarven city built on an outcropping rock formation surrounded by miles and miles of hills and rocky expanses. From afar, it is clear the great cliffs that support Heart of the Mountain did not come to be naturally. Parts of the rocky cliffs show signs of intense heat, the rock and salts in the walls are crystallized and brittle. Many dwarven stone smiths and architects agree that Heart of the Mountain should have fallen on itself a long time ago, the great rock should not be stable enough to withstand the passage of time, and yet it has. The rock formation is strangely sturdy; it is magical to the core; the blood and fire of dragons sculpted it. Heart of the Mountain is almost one thousand years old, past dwarven kings are the stuff of legends and myths told from mothers to children generation after generation. One of such tales hints about the origin of the great rock where the city is. When the world was young and the lesser races did not roam the land, dragons and giants were the lords of all. Their reigns lasted for millennia. The only force stronger than their might was the hate they felt for each other. It is told that the ancient dragon king Zardunnar’is once fought a horde of giant warriors in the skirts of a great mountain. Zardunnar’is was hard to reach, he flew all around the mountain top, breathing fire and avoiding the spears the giants threw at him. They fought for years, that is what the legend says. Giant strikes and dragon fire were so intense that they started crumbling the mountain down. Chip by chip and rock by rock the mountain side diminished until only the very heart of the mountain itself remained. The stone outcropping was later settled by the first dwarven travelers. Upon inspecting the carbonized stone and crystallized sand in the cliff walls, the ancient dwarf king decided to built his keep on the top of the rock. Heart of the Mountain is a natural fortress. The city is divided in three main wards, each of them separated by a hundred-foot cliff. The different wards are only accessible through a single elevator in each ward. The elevators work with a complex pulley system that raises a wooden box, the elevator takes less than five minutes to reach the next level. In times of war, the elevators are brought up to impede enemy forces from storming the city. The cliff walls to the first ward are one hundred-foot tall, making an invasion attempt a complicated task. In the event of an army taking the first ward, the soldiers are instructed to fall back to the second ward, which is another hundred-foot up. Any conscripts not able to fit in the last elevator trip are thrown ropes to climb up if they can. These are things the dwarves of Heart of the Mountain are trained to do, but in fact, the city has never been taken, not even the first ward. It is a source of dwarven pride that such a prosperous and powerful city has never fallen. Foreign armies have sieged the city countless times to no avail. The dwarves have underground larders that can last for years. There are also secret tunnels that reach an underground network of passages that connect caves, mines and other dwarven settlements. Kormin Fierceaxe is the current holder of the dwarven crown. Dwarves have longer lifespans than humans, the Fierceaxe dynasty has reigned Heart of the Mountain since it was settled. Kormin Fierceaxe is the ninth king. He is an old dwarf, his grey beard is braided in three, with a golden ornament hanging from each end. He used to have a stronger character, more military inclined, but centuries of peace have made him soft and gentile for a dwarf king. His eldest son and heir Kordun is almost one hundred years old and growing tired of waiting for his father to die or step down. Kordun is young and impatient, they call him “Dragon Fire” among the other soldiers in the barrack with which he trains almost every day. Kordun has lost his respect for his father after decades of suggesting a stronger fist when managing his realms. The king of Heart of the Mountain has subjects in hundreds of smaller towns and settlements miles and miles away from the city. The collect tithes and tributes from all of them, but some places have become difficult to work with, Kordun would have gladly marched to “persuade” them to return to the king’s justice. The highest part of the rock, the third ward, is where the main keep is. An external twenty-foot tall wall stands between the last elevator and the keep. The keep has its own inner wall. Were it stormed, the royalty and soldiers can still fall back to the basements or the great tower as a last means of defense. The basements have a secret that leads deep down to the underground passage system, only the king and his children know of such exit. When the keep was built, the first king ordered the finest craftsmen to build the a pair of battle-horns. He wanted the sound of such horns to be heard miles away and their sound to strike fear in the enemies’ hearts. They crafted the horns with copper and bronze; the horns’ mouthpiece is in the great tower next to the royal keep. The horns go down through the rock and go out on the Cliffside (Area 9). There are three elevators in the city connecting the different wards. Each one features a small building on each end where the boarding happens. The elevators work through a complex system of pulleys that are moved by teams of mules. Up to fifty medium size creatures can ride the elevator to the next level at a time, the trip takes almost five minutes. The main road that traverses each ward up to the main keep divides the Iron Market in two sides. The north side is where dwarves sell ores, gems, steel and all kinds of stone and metal craft, including weapons and armor. The south side is a shifting market where foreign merchants sell their wares before parting for the next destination. The must pay high costs to be able to sell inside the city, it is usually profitable for them to do so, despite the high fees. A bronze statue for each past kings stands proudly in the middle of this clearing. The statues are all in aggressive positions, most of them brandishing axes. People of all kinds frequent this area. The only accepted religion in Heart of the Mountain is the church of Moradin. The building is not only a house of worship, there is an underground level where furnaces burn all the time. Dwarves from all social strata in the city must help from time to time at the forges to produce different kinds of metal crafts. The main road in the second ward is decorated with gardens and parks. It is meant to impress travelers that come to see the king. The stone wall is twenty-foot tall. There is a single gate near the third elevator in the city. There are two barracks right behind the gate with garrisons active at all times. The main keep of Heart of the Mountain was built almost a thousand years ago. It features a long hall where the dwarven king has audiences with visitors. The royal quarters are several stories below ground level, the chamber closest to the center of the mountain is where the king sleeps. The watchtower is the highest building in the city. From its top all the surrounding lands are visible. The mouth pieces of the battle horns are here. In case of attack, defenders can retreat to this tower as a last means of defense. The horns protrude from the mountain side almost fifty feet below the top level of the city. Blowing them is not a simple matter. Only a person with strong lungs is able to blow them to their full volume.